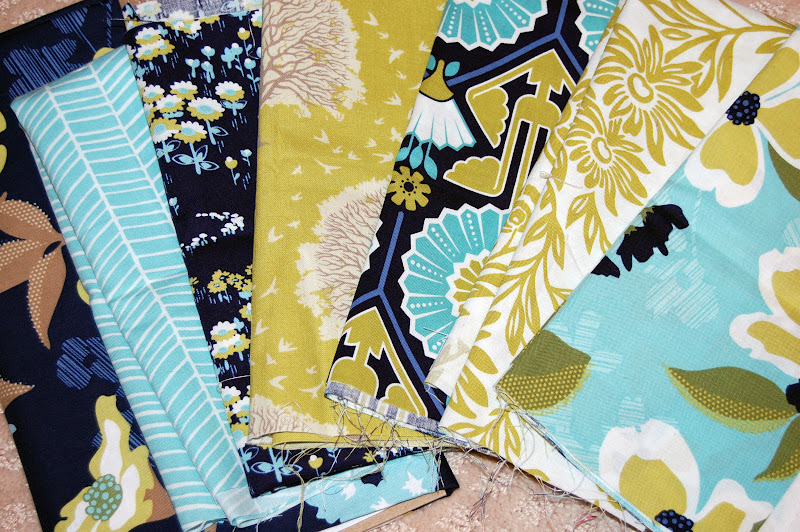 So, of course that means a flurry of sewing today. I'd really rather not be sewing at the last minute (which, technically, would be tomorrow), but I always seem to leave the guild stuff until the last few days before our meeting. 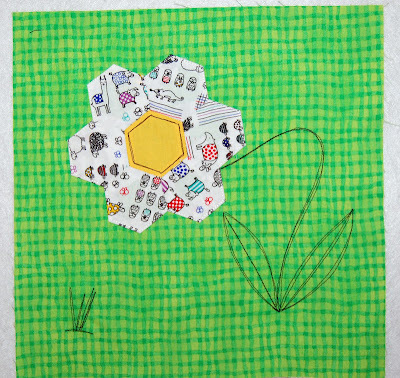 This month, we had a challenge to create a logo block that represents the Baltimore Modern Quilt Guild. We'll vote on all the blocks submitted, and the winner's block will be our logo block for all sorts of things ~ stationery, membership cards, etc. I've lived here less than two years, but long enough to know that the Baltimorons are crazy about their Ravens and Orioles. Although not terribly creative, this is my entry. I made the hexy flower over a year ago. If you ever look at the posts of my design wall, you've probably seen it hanging out in the corner. Well, now it's on a block. I've been working on my free motion sketching lately. 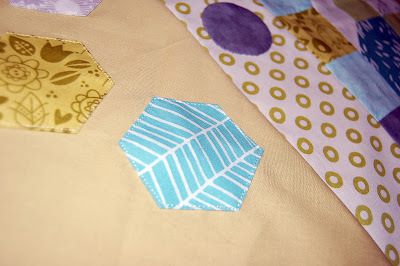 Maybe I'll be brave enough soon to actually do something on a quilt! In other quilting news, I've stalled on my strings. Too many other things (mainly spring break!) jumped in front. But now that my guild stuff is finished, I'm ready to jump back in. 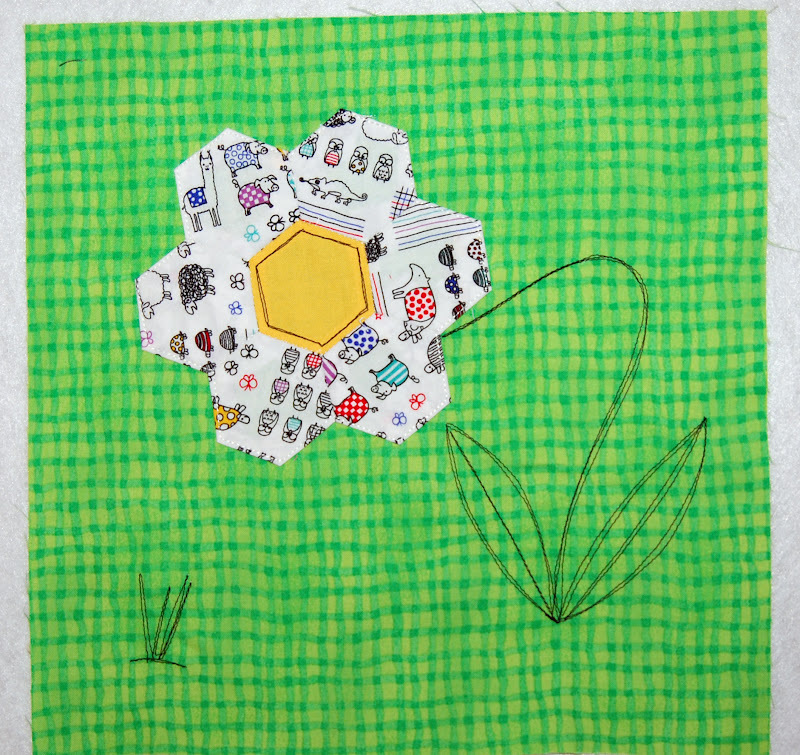 I'm starting up another round of Bee Vintage, my vintage sheet quilting bee on flickr. I'm looking for a few more people, with a May start date. If you're a vintage sheet lover and want to get in on this, hop on over to the flickr group, read up on what we're doing, and if it sound good, send me a flickr message. Speaking of flickr, I've been pretty inactive over there, as far as bees, swaps and quilt a longs. But this one, I think I'm going to do: The My Precious QAL. The idea is this: cut into your precious fabric that you've been hoarding. Make whatever you want, however you want, but take your best stuff out of the museum and cut it up! I've been holding on to my small stash of modern meadow for 2 years, now. I think it's time. I've got close to 3 yards. Certainly enough to make something. Actually, don't you think it would look awesome in that garden gate pattern?